Finally on day five the winds shifted more southerly offering us some perfect spinnaker flying weather. We made good progress despite the light winds. The Azores High developing nicely at this time of year, keeping nasty lows at higher latitudes. Day four: Tuesday 23rd May. Two years since sailing this route and the conditions are a little kinder. Northeast winds have shifted to easterly so we are travelling further to the north east on a course of 020degrees. The winds are expected to shift further south helping us to maintain our course. Our aim is to reach 34degrees latitude and catch the bottom of a passing low and ride this on an easterly course to the Azores. Winds are no more than 12kn and averaging 8-10kn. Seas are slight and the air is warm during the day and cool in the wee hours of the morning as I sit on watch. We haven’t seen any other boats since Inishnee disappeared ahead of us on the AIS. But last night the glow of a vessel on the horizon had me wondering who that may be. Day five: Wednesday 24th May. After a calm evening, but still managing to sail at 4.5kn, we put up our spinnaker in between having our morning coffees. With the wind now coming from the southeast and still around 10knots our vessel needs a helping hand to shift all 12 tonnes of Blue Heeler in light breezes. Before long we were moving along at 6.5kn with only 9-10kn of wind. Perfect! With the wind forecast to remain the same, we kept the spinny up all day and even threw the night snuffing it the following morning when the breeze strengthened. With no wind and not enough solar panels to keep everything charged, every other day (weather dependent) we would run our small Honda generator to top things up. 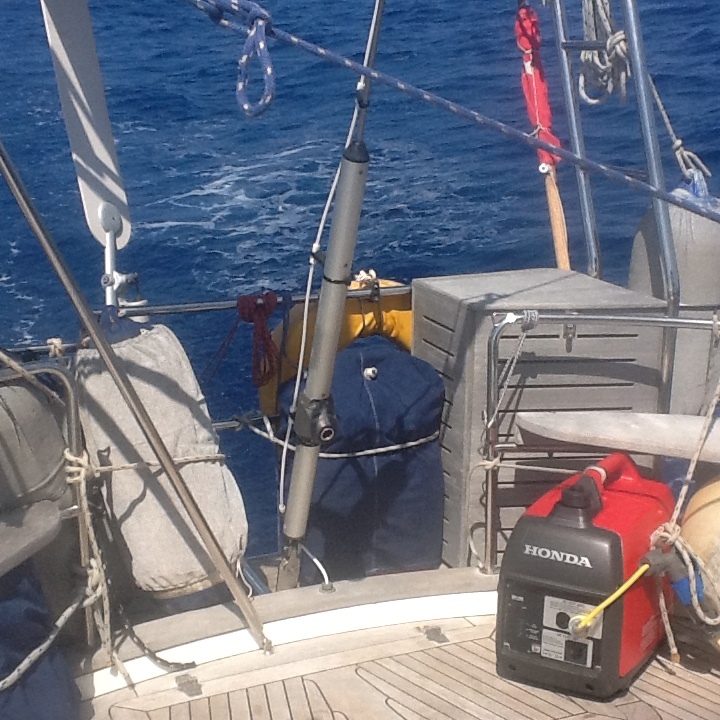 Our Pacific Plus Wind Pilot worked like a charm over the voyage, taking the pressure of the auto-pilot. More solar panels needed – added to job list! Day six: Thursday 25th May. Another glorious sailing day! Wind is 12-15kn from the southeast and our course is 040degrees. 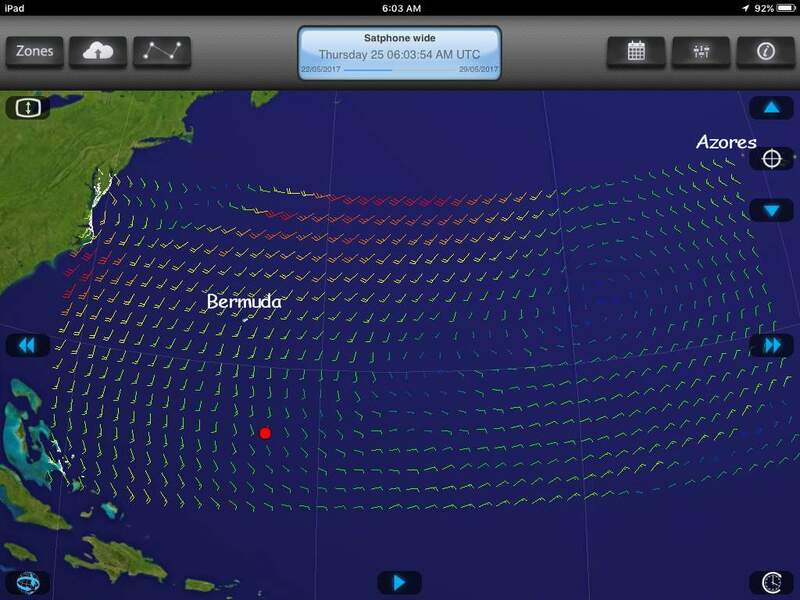 We are sailing at 6.5kn and settled into the rhythm of the ocean passage. Skipper relaxed and looking forward to a piece of stowaway cheesecake for dessert! Date/time(UTC)/position: Thursday 25th May 2017 / 1530UTC / 27deg31min N 062deg46min W.